Hear all about climate innovation, clean-tech and circular electronics. Specially for entrepreneurs,accomplished professionals, young starters and students. 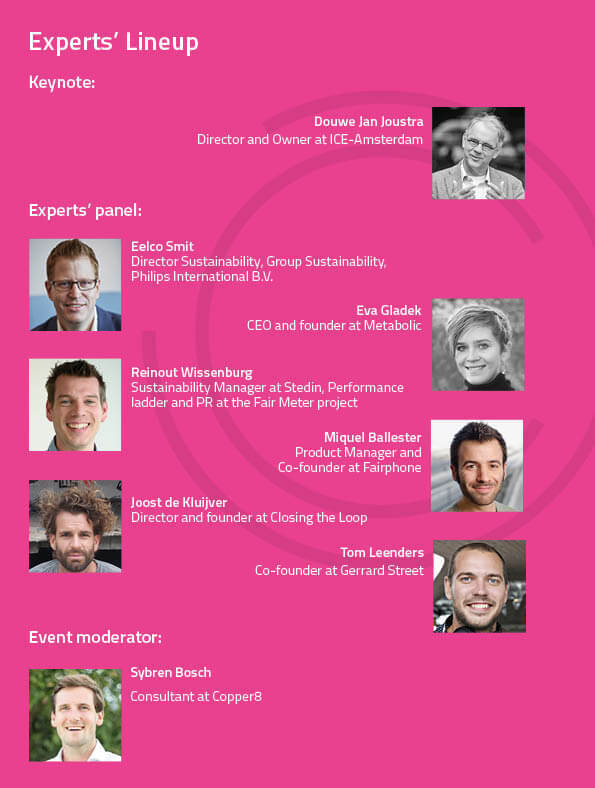 This is the first Spark event of this year, where we will be discussing the implementation of Circular Economy and the achievement of positive climate impact along the electronics value chain. What better place to hold this event than Fairphone’s creative workspace, located inside one of the famous Pakhuizen of Amsterdam! A panel of expert speakers of the field will share their experiences, providing us with great insights regarding the current challenges that the electronics industry is facing and what will be the potential circular solutions in the way forward. Sustainable procurement, design for disassembly and e-waste management will certainly be in the agenda! o The “Fairphone disassembly challenge”; how fast can you dismantle it? o E-waste Arcade games; insert OLD PHONE to play! Click here for the Lineup with links to the LinkedIn Pages of the experts. You will also have the opportunity to meet and connect with members of the entire Climate-KIC community- including members of our Alumni Association– as well as other like-minded professionals, entrepreneurs and students! Our interactive sessions, together with our New Year’s festive drinks will offer the perfect setting! We reached the amount of participants, so unfortunately you can not register anymore for this event. If you want to send us a message, please fill in this form. For any further questions, please feel free to contact Gareth Wakeling, Education Manager via NLEducation@climate-kic.org. Climate-KIC Education offers added value to Master’s and Ph.D. degree programmes at the best academic institutions across Europe as well as an annual summer school. Moreover, our pre-incubation programme “Greenhouse” helps entrepreneurs to explore their business ideas. Spark Lectures are community events of Climate-KIC which take place five times a year. These thought-provoking events are held by climate innovators and opinion leaders in their field and are meant to inspire and trigger fruitful discussions. Fairphone is a social enterprise that is building a movement for fairer electronics. By making a phone, we’re opening up the supply chain and creating new relationships between people and their products. We’re making a positive impact across the value chain in mining, design, manufacturing and life cycle, while expanding the market for products that put ethical values first. Together with our community, we’re changing the way products are made.